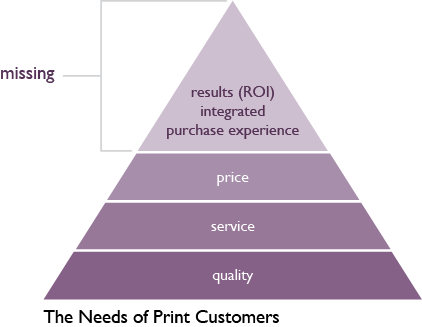 Much like Maslow’s Hierarchy of Needs for humans, printers need to elevate their offerings above quality, service, and price in order to stay competitive. Computer user experience/design (sometimes referred to UI or usability), has always been an interest of mine. I’ve been reading a lot about it lately and now all I seem to notice is user experience/design weaknesses in everything I use. Once you get this usability bug in your head – you start to wonder why everything isn’t well designed from the perspective of the end-user. Yet when we speak of software user experience we use terms like; functional, reliable, and usable. Those are terms typically associated with minimum standards. I think we’d all agree that most laptops on the market today meet those basic requirements, yet what do you hear people say about Apple’s MacBook Air? Functional, reliable, and usable are not their first comment – more like cool, elegant, or delightful. Apple has proven that more people have an eye for design and want well crafted products, and most importantly they are willing to pay a premium for them. I just finished an excellent book that described this idea brilliantly, “Designing for Emotion”, by Aarron Walter. Aarron compared Maslow’s hierarchy of needs to the goals we typically set when designing computer interfaces. 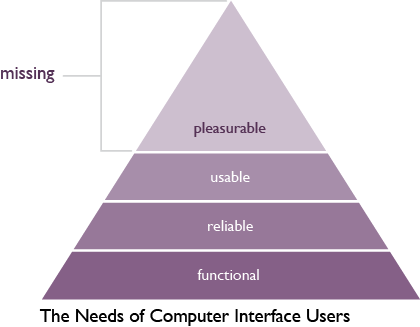 He added a very important missing element to the usability hierarchy, pleasurable. The web has matured to a point where functional, reliable, and usable are expected; now we have to move past the minimum expectations into the land of customer delight. Meeting customers’ expectations only gets you so far, we want people to connect with our customer experience and then “promote” our products and services to their networks. This is the idea behind the Net Promoter Score, or NPS®, which is based on the fundamental perspective that every company’s customers can be divided into three categories: Promoters, Passives, and Detractors. You can distill your performance through the eyes of your customers based on the answer to the simply question, “How likely is it that you would recommend [your company] to a friend or colleague?” If you want to create Promoters then you have to deliver beyond the minimum expectation. Not surprisingly I have found a way to relate all of this to the print industry. Print could benefit from moving up the hierarchy of needs – here’s the print industry’s version of Maslow’s Hierarchy of Needs. Printers have been living and thriving by competing on quality, service, and price for a long time. If you haven’t noticed, this isn’t enough anymore because your competition is not simply other manufacturers, the competition is the new channels of communication created by the digital economy. You still have to be a great manufacturer (expectation), AND your value proposition has to extend beyond manufacturing to address your customers higher up on their hierarchy of needs. If you approach your prospects or existing customers with a value proposition that includes quality, service, and price – guess who you sound like? Every other printer on the market, very forgettable and you are talking about topics that the customer expects to be delivered as a standard offering, no sales pitch required. On the other hand, if you focus on providing real value in the purchasing experience, you can make an incredible impact on the customer’s overall loyalty to your company/brand/product. In the book, The Challenger Sale by Matthew Dixon and Brent Adamson their research shows that the sales experience contributes a whopping 53% contribution to customer loyalty. What’s the other 47%? Just little things that we obsessively focus on like company, brand, product, service, value-to-price ratio! So the sales experience outweighs everything else combined. I’ll say that again, the sales experience outweighs everything else combined when it comes to influencing customer loyalty. We focus so much on what we sell; it’s time to focus more on how we sell it. Number six is of course my favorite item on this list because it points back to yet another reason to make online ordering (web-to-print) available to your customers. If you don’t have a self-service online option, you’re wasting your customer’s time on simple orders and you’re wasting your labor hours on something that can be done better by software. 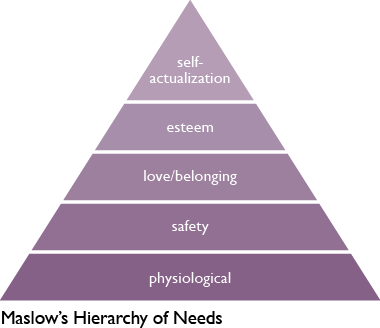 There are many needs in the customer’s hierarchy of needs above and beyond quality, service, and price. I selected three, purchase experience, integration, and results (ROI). The integration and results are about what product you’re selling. Print cannot stand alone anymore – it has to play well with its new digital communication buddies (e-mail, online, pURLs, social media, etc.). You don’t necessarily have to offer the digital communication products and services, but you have to understand how print fits into the overall communication mix. With digital communication comes the ability to specifically and relentlessly measure ROI. We have never been good at this with print – I think we actually liked printing way more than anyone needed, getting paid for them all equally, even though 30% were simply recycled. Marketing is now being held to the same budget oversight and logistics optimization as the rest of the company – the party is over for brand folks to be the budget exception. The print you manufacture has a purpose, dig into that purpose so you can influence the ROI on the deliverable. Print has evolved before; print providers have made major moves with manufacturing technology, the desktop publishing revolution, etc. With each evolutionally step, we are expected to get better, offer more, and continue to discover the customer’s next need and then satisfy it profitably at scale. No problem. Our mass media world is transitioning to on demand - some age groups are moving to it faster than others. The hierarchy of needs comparison is a great way to look at how the professional consumer(B2B)is creating a personal experience today. More than ever it is all about 1 to 1 relationships. Great article and point of view.